Hopefully you’ll have read my previous posts on how we got the idea of transforming our back garden. Time to tell you how we started with the physical part of the work and hopefully this will inspire you to have your own project in your garden? Go on… you can do it! That’s a good question. The first step can be the hardest if you over think it. The important thing is to just make that start. We had very overgrown shrubs and trees along the left boundary of the garden. There is actually a wall and a picket fence on the left of the garden but it was covered by the unruly greenery. So it made sense to start by clearing the space. Preparing the empty canvas so to speak. We had to decide what we wanted to keep in the garden and what we needed to clear. We have an enormous but beautiful Hawthorn tree on the far left side. It was really a very large shrub that had grown very tall and was taking quite a bit of space. We didn’t want to take it down but it needed a haircut. So we carefully cut all the lower branches, and created a trunk and a much higher canopy. Be careful when cutting a Hawthorn, it does have some vicious thorns. 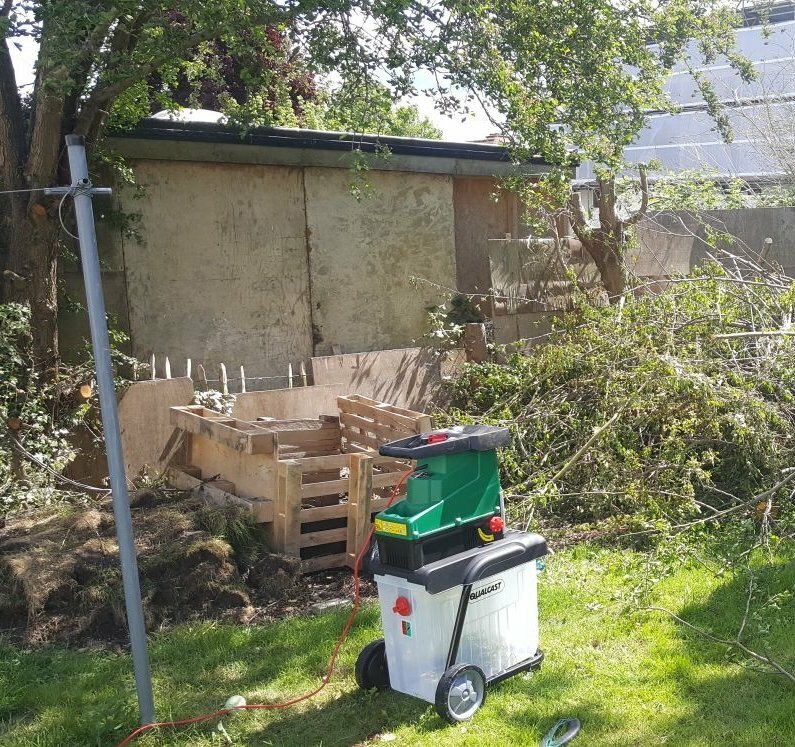 We cut all the branches into smaller, more manageable pieces and Darren built a compost bin out of pallets which we placed in the space the cleared branches had created. We then bought a shredder. Best thing we did! We were able to shred everything and put it in the compost heap. We got our shredder from Argos as they had a special offer at the time (we do love our bargains). It’s a Qualcast 2800W Silent Shredder and works very well, even for chunkier branches. My advice is to read the reviews and you should be able to find one for your needs. 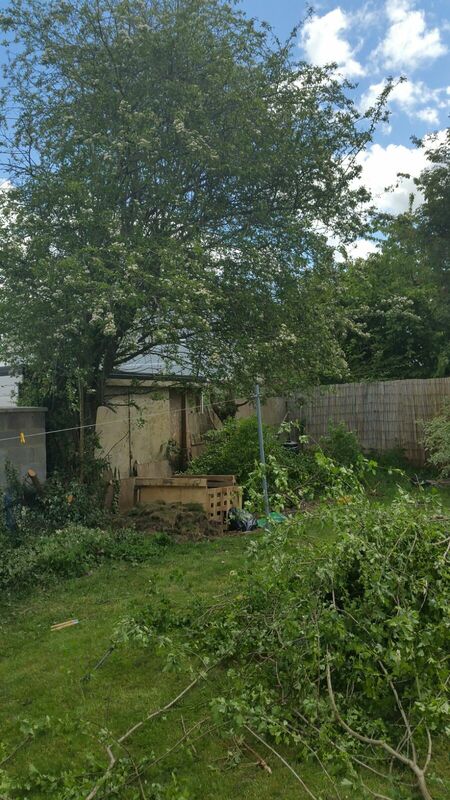 This space turned out to be very useful as work progressed, there was so much that needed cutting down and clearing. Well, that was a full day’s work, but we felt a real sense of achievement. We made a start! Start by clearing your space. Decide what you want to keep and what you don’t want. Cut down any trees, branches or shrubs that you don’t want or that are overgrown. Invest in equipment that may help, like a shredder or telescopic loppers. This will make your work much easier and you can use it for maintenance once the garden is finished. Make sure you have lots of cups of tea or coffee and don’t overdo the physical work. Above all, pace yourself and don’t set any deadlines so there’s no pressure, work in your own time… it should be fun as much as it is hard work. 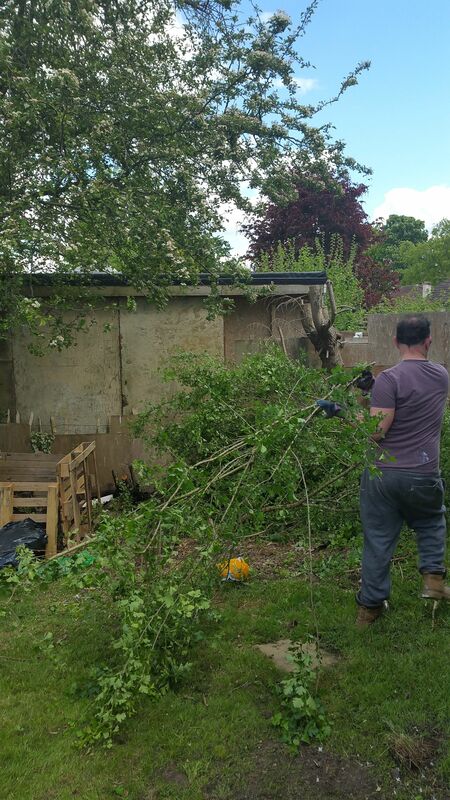 I hope you will stay tuned for our next installment of how we transformed our back garden… see you again soon!